Hello my lovelies! We're already five days into March and we could say that spring is upon us. It's still pretty cold where I live, but it's been sunny all week and I can tell that the air is changing. To celebrate the coming of spring I've been wearing light colors and pastels on my nails all week. I've started with a polish from the House of Colour collection from China Glaze, which is the Spring 2016 collection. I picked out 3 polishes from this collection and today I want to show you the first one. I don't wear pink very often (read never) but this one caught my eye because it's very subtle. Check it out! Let's Chalk About It is a very light pastel pink creme. It's almost white, but you can clearly tell that it's pink in almost every light. I picked it up because I figured it would be a good base for nail art, especially for the spring. 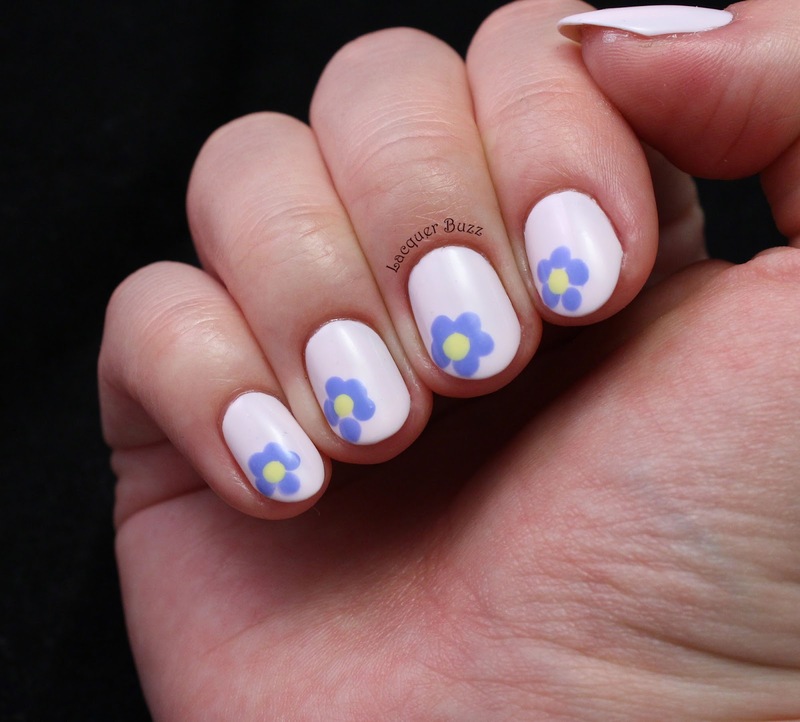 I already had a great idea of stamping over it but I had one of those days when nothing worked, so I ended up with these simple flowers instead. I know that a lot of people weren't happy with the formula on this one but I think it's ok. Despite the name and the very light pastel color, it's not chalky at all. It can be streaky, especially on the first coats. If you are careful you can get away with two thicker coats, or you can go with three thinner ones. The polish is on the thicker side, so make sure you wipe the brush on the bottle or else you'll end up with tons of it on your nail. I ended up using two coats with a bit of leveling up on the second one. 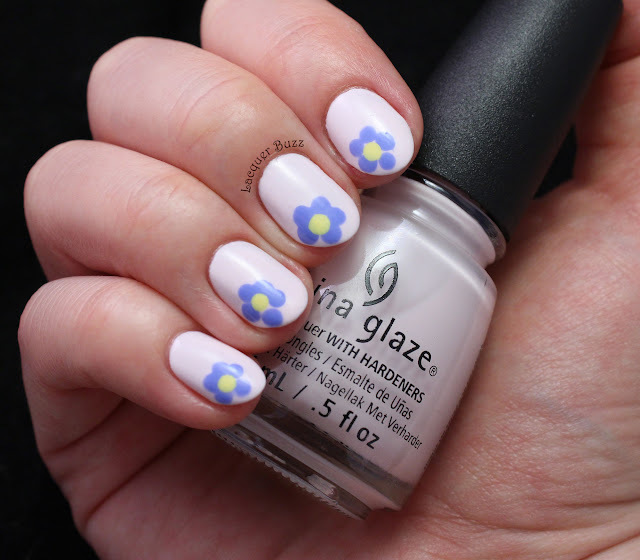 After the stamping disaster, I picked up my dotting tool and created these simple flowers using China Glaze Boho Blues (from last year's Road Trip collection) and Lemon Fizz (from the 2010 Up & Away collection). 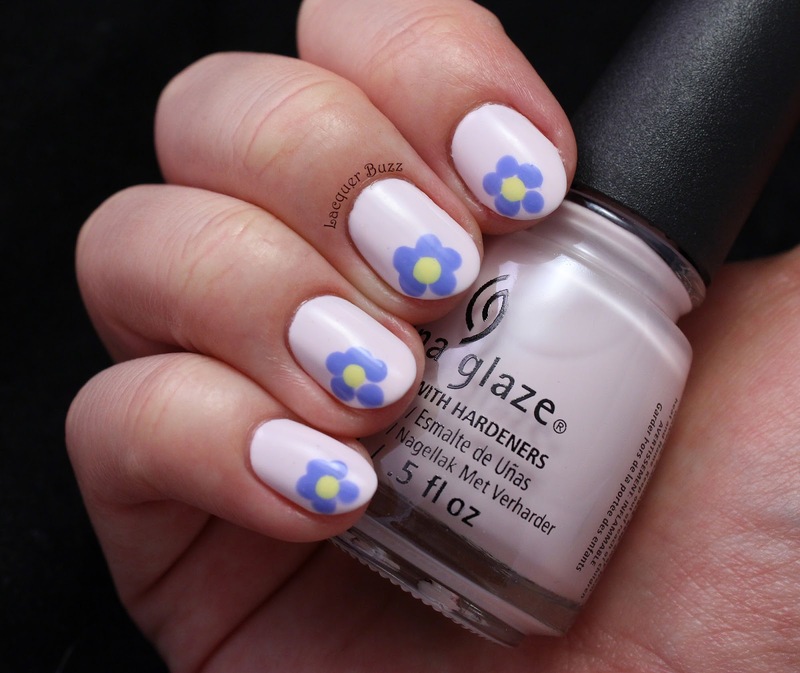 So there are polishes from three different China Glaze spring collections in this manicure. You can tell how much I love spring polishes from that. 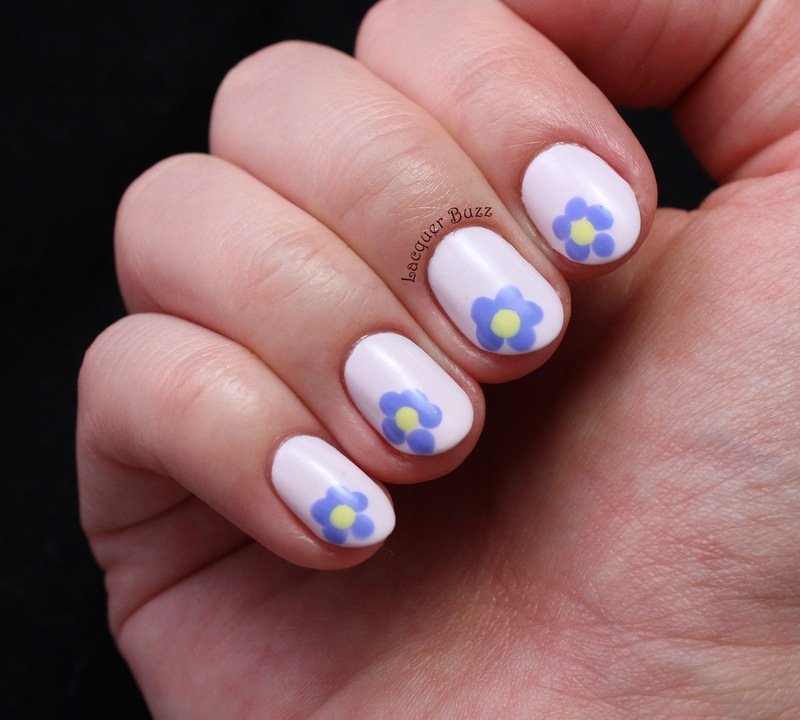 I hope you enjoyed these nails and have a beautiful and sunny weekend!